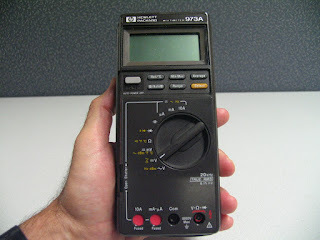 I have owned a Hewlett-Packard 973A multimeter for longer than I can remember. What has always amazed me about this meter is that I have never had to change the batteries in it! It runs off of 2 AA batteries (in series, of course), and earlier this week, I had to open it up to change a blown fuse for the mA/uA current measurement input (that’s what I get for lending the meter to someone). While I had it open, I took a look at the AA batteries and was surprised to see a date code of 04-99. That means these batteries have been powering this multimeter for at least 13 years! I admit that I don’t use the meter very frequently, but I am still impressed with how long these batteries lasted. 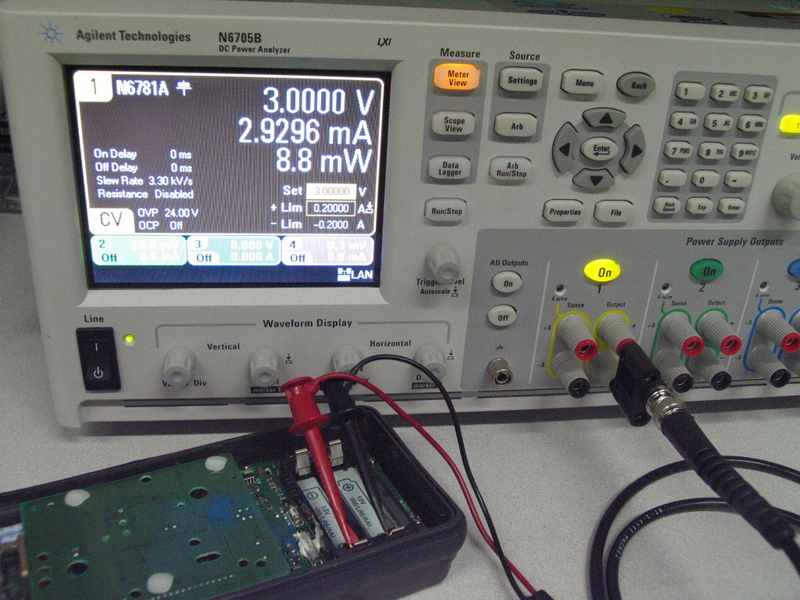 The series combination measured about 2.6 V – still plenty of charge left to power the multimeter (2 new batteries in series measure about 3.2 V). 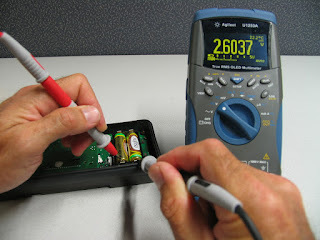 Since we make power supplies that can perform battery drain analysis, I decided to take a quick look at the current drawn by the multimeter from these batteries. 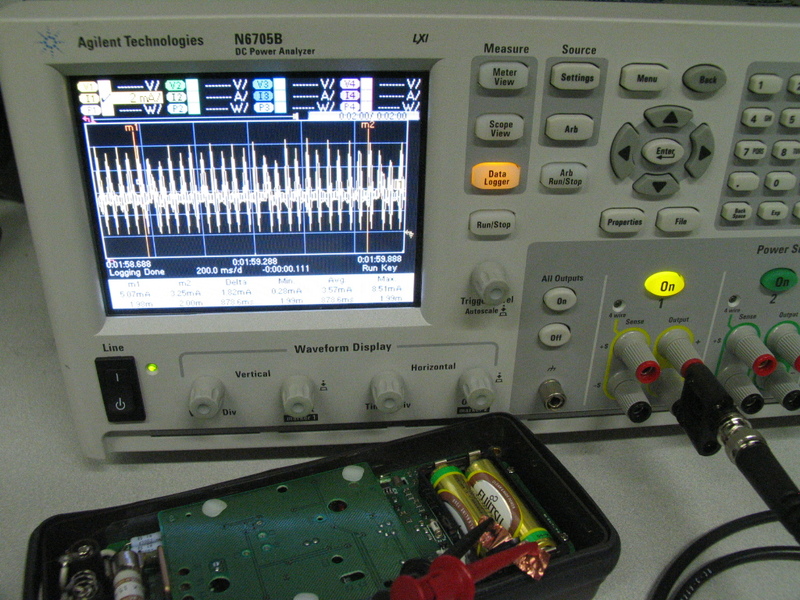 I used an Agilent N6705B mainframe with an N6781A Source/Measure Unit (SMU) installed. 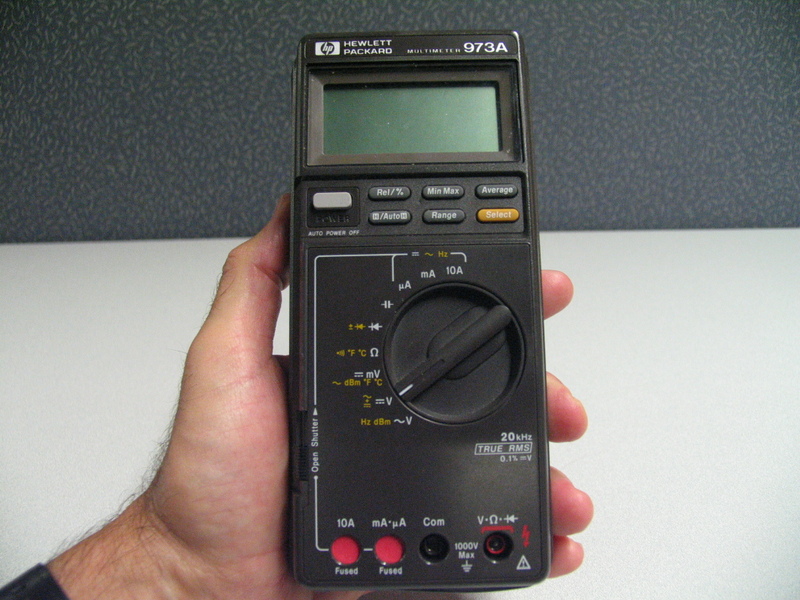 This SMU has many features that make it easy to analyze current drain. For example, I set the SMU for Current Measure mode which means it acts like a zero-burden ammeter (an ammeter with no voltage drop across the inputs). 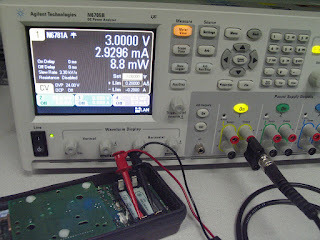 I found that the multimeter (set to measure DC V) draws about 3.5 mA from the 2.6 V series combination of AA batteries. 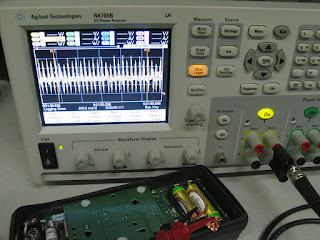 I used both the Meter View feature of the SMU and the Data Logger to verify the current. The Data Logger shows the dynamic current being drawn from the batteries and I measured the average current between the markers. Typical AA batteries are rated for about 2500 mA-hours, so with a 3.5 mA load, they will last more than 700 hours. It is no wonder that the batteries lasted a long time; I use this meter only a few hours per month, so assuming 3 hours per month, the batteries would last about 20 years! 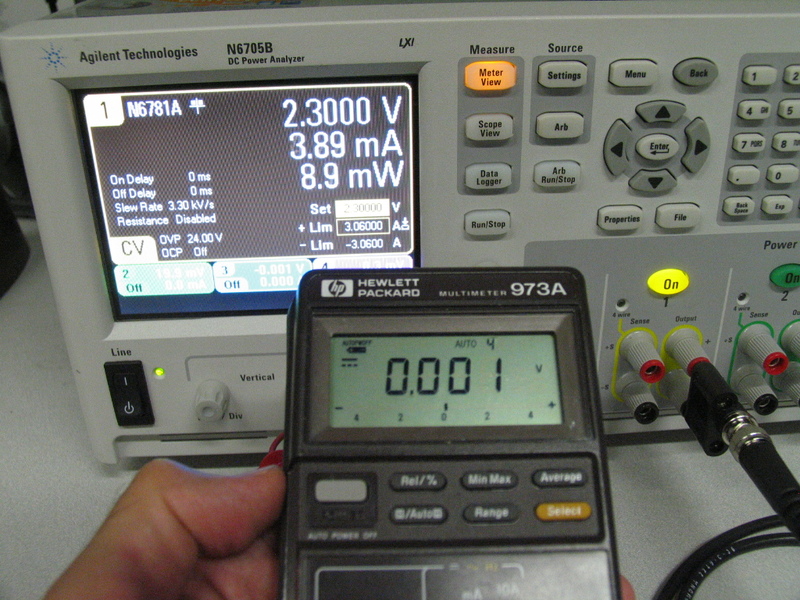 While I had the back cover off, I removed the batteries and powered the multimeter directly from the N6781A SMU. I could then slowly lower the voltage and find when the low battery indicator came on. This happened at about 2.3 V. Continuing to lower the voltage, the LCD display continued to work down to almost 1.0 V. I also noticed that the current drawn by the multimeter increased as the voltage decreased – the multimeter was drawing a nearly constant amount of power from the source – roughly 9 to 10 mW. I figured while I had the multimeter open, I might as well install new batteries. 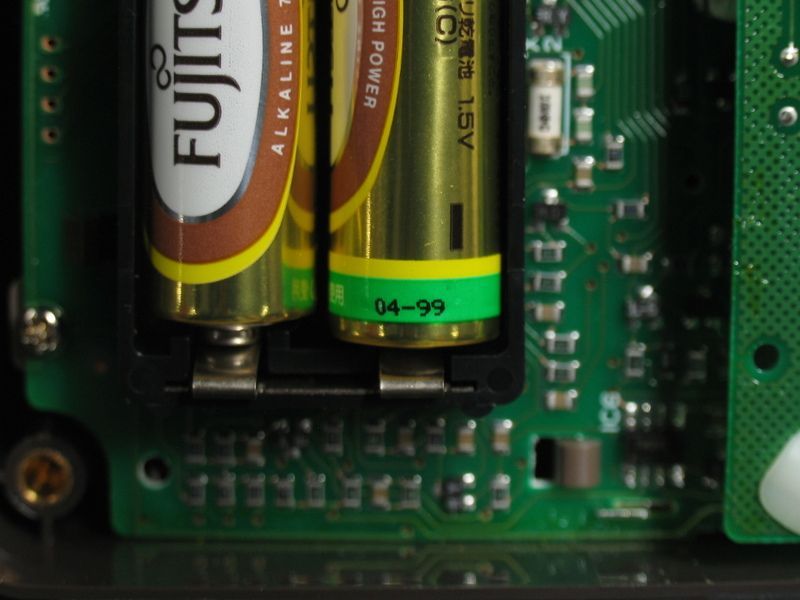 I doubt I will write another post the next time these batteries need to be replaced in 20 to 30 years, but keep checking here.… you never know! I've had the same meter since I was an apprentice, it cost me three weeks pay. I still use it all the time. The gate over the current sockets keeps the insides clean as well as idiot-proofing it (almost). Much better than a fluke and more accurate. 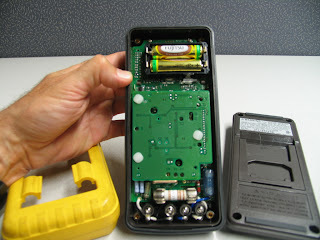 I was describing it to someone and this blog came up, come to think of it I think I did change my batteries once. 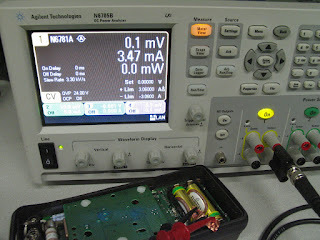 Yeah, these meters work really well and I expect mine to continue to provide accurate measurements for years (decades?) to come. Thanks for the comment!